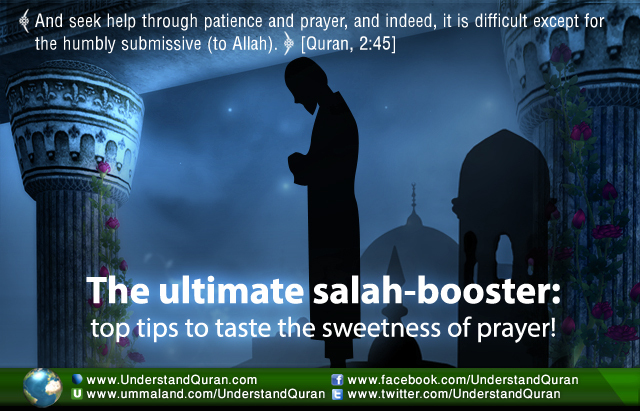 Understand Al-Qur'an Academy > Articles > 12 Tips to Boost Your Salah! It just doesn’t feel the same . . . I lost it . . . How can I get it back? Get ready for the ultimate salah-booster; a set of amazing productivity tips to enhance your prayer, give you a fresh perspective on the world of salah, and make you love your prayer like never before, inshaa’Allah! The Prophet salallahu ‘alayhi wa sallam told us, “Alhamdulillah fills the scale!” [Muslim] Really feel gratefulness when you say alhamdulillah. Did you see those documentaries where they zoom out from the cells of a plant’s leaf all the way to the planets and galaxies? Now instead of that leaf, start the zoom out process with the image of yourself standing before Allah. Then zoom back down, back through the universe, to the place you are standing in prayer. The next time you pray view yourself from above and far away and truly taste the meaning of Rabbil aalemeen (Lord of the worlds)! You alone we worship, and unto You alone we turn for help. Let this remind you to make Allah alone your focus, not the people. So when you are asked, why did you do this or that (deed), you can firmly answer: for Allah! Feel this ayah by knowing that the salaf used to weep for hours reciting it. One of them was once praying in Mecca. His friend went ahead and did the tawaf and when he returned to him, he was still at this verse, repeating it and crying, until the sun came up. 9. Say ameen as if your life depended on it. When you say subhana Rabbiyya- al-‘atheem (How perfect My Lord is, The Supreme) in ruku’, focus on the pronoun that means my (in Rabbi). It adds that element of bonding: He is My Lord, who raised me in His care and who is nurturing me. Know the Prophet salallahu ‘alayhi wa sallam and the Companions used to be in the bowing position as long as he would be in the standing segment of salah. One companion said that he recited Al Fatiha, then Al Baqara, Ali Imran, An-Nisaa’ and Al Ma’ida, and the companion Abdullah Ibn Al Zubair was beside him, still in his ruku’! Your sujood is the ultimate symbol of complete submission to your Creator. The Prophet said: The closest that a servant is to his Lord is when he is in prostration. [Muslim] And: Prostrate much because there is no Muslim that prostrates to Allah except that Allah raises him one degree in Paradise by it and forgives for him a sin. [Ahmad] Imagine you are being raised one degree in Paradise with each sujood and a sin falls off you with each prostration. Prostrate with body, heart, and soul and taste the sweetest feeling in the world! After the words of the tashahhud (sitting position at the end of prayer) and before the tasleem (saying salaam to indicate the end of prayer), there is a precious moment many waste! When the Prophet salallahu ‘alayhi wa sallam taught Abdallah ibn Mas’ood radiyallahu ‘anhu the tashahhud he said: … Then let him choose whatever supplications he wishes. 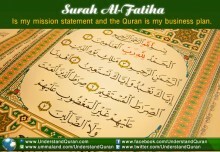 [Al-Bukhaari, Muslim]. Just before you say tasleem, make at least three heartfelt dua’s to benefit from this treasure chest instead of rushing to say the salaam! AND THE ANSWER IS . . . AZ-ZHAAHIR! AND THE ANSWER IS . . . AL-WAARITH! Turab December 6, 2017	Log in to reply. UQA_S December 12, 2017	Log in to reply. Aameen JazakAllahu Khair help us spread this noble work by sharing in your circles. Sayeeda Kouser December 7, 2017	Log in to reply. Mohammad Khalid December 7, 2017	Log in to reply. May Allah rewards you equivalent to all those who benefit from such a nice article. Aameen JazakAllahu Khair for your feedback help us spread this noble work by sharing in your circles. Shirin December 9, 2017	Log in to reply. Yasmeen Begum December 11, 2017	Log in to reply. Aameen JazakAllahu Khair for your feedback, help us spread this noble work by sharing in your circles. neha December 11, 2017	Log in to reply. JazakAllahu Khair for your feedback, help us spread this noble work by sharing in your circles. Sameena.M.Hawalgi December 12, 2017	Log in to reply. Walaikumsalaam Wr Wb, JazakAllahu Khair for your feedback help us spread this noble work by sharing in your circles. Lieselotte peters/traboulsi March 11, 2018	Log in to reply. Loved ur article, a real boost for my prayers.